In just two months, give or take, I’ll be out in the garden planting ‘Green Arrow’* peas and lettuce and onions. It will be a beautiful early spring day when I get the wheelbarrow out of the garage, load it up with a rake, seeds, onion sets and row markers. Then I’ll look over all the hoes, and pick out one, maybe two, to make nice straight furrows in whatever raised bed I choose for these early crops. Yes, it’s January and thoughts of planting this spring may be more of a dream right now, but there are just two more months before I’ll really be out in the garden, the currently frozen garden, planting seeds. While I wait two more months to get out into the garden, there is plenty of winter gardening to do inside. I’ve got all kinds of stuff to do to prepare for spring. I’m going to be busy doing it all, too. This winter gardening can really wear a gardener out. And it is mentally challenging. The most obvious and taxing winter gardening chore, the one staring me in the face saying “do it now” is the task of browsing through seed catalogs and ordering seeds. Even though I’ll only order from two or three (or four, maybe five tops) seed companies, I look at all the catalogs I get, just in case there is something New! Unique! Horticultural Breakthrough! that I must have. Then I get down to the serious business of listing all the seeds I want, followed by pruning the list back, then standing back and looking at it, then pruning it again. This first round of list pruning is based on how much space I have, or think I have, in the garden. The second round of pruning the seed list is more like thinning out seedlings, as I work to get the list down to a reasonable amount to spend, or at least to an amount that I’m willing to spend. Whether that is really a reasonable amount or not probably depends on if you are a gardener or not. There’s a lot of math involved in this part. Not just adding up prices and seeing dollar signs, but calculating space requirements and doing advanced computations to see if it will all fit in the garden. Sometimes this part even involves a calculator and the use of Excel spreadsheets. In the end, I also tap into my past experience and just guess and hope it will all work out. There are other winter gardening chores I could be, should be, doing, but right now all my energy is focused on seeds and ordering what I need. After all, in just two months, give or take, I’ll be planting peas! *I only plant ‘Green Arrow’ peas. No other pea variety will do. I must have ‘Green Arrow’. A least you won't be fretting over which pea seed to purchase!! You make me want to plant veggies, Carol! I just don't have enough room to do right by them, though. The yard police would probably go ballistic if I ripped out the rest of the lawn and put in a veggie garden! If we're lucky, those of us up in Maine will get to partake of your dream spring day sometime in mid to late April... but only if we've been really good and hold our tongues just the right way. Like Chris the Gardener, I'll be lucky to be planting peas by mid April. Last year, because of lingering snow cover, it was very close to May. Still the image you present is just lovely. There's nothing like that first pea-planting day in the garden, where the sun actually feels a little warm on one's cheek. If I ever decide to grow bush peas, I'll take your advice with "Green Arrow". 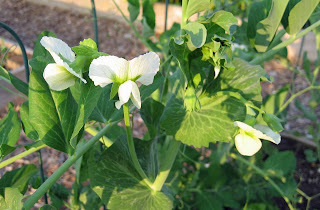 My husband, who only likes a handful of vegetables, is gaga over snap peas and snow peas... so we grow those in spades! I love this blog, by the way. Thanks!! Having just emerged from a dreamy fireside afternoon with the veggie seed catalogues, I am totally in step with you, Carol! And now, I am moving on to the second step of this process - i.e., the editing down to something which I find reasonable, although the other member of this household may not agree. Do I REALLY have room for fingerling potatoes? Do I know enough to grow them? How many onions do we need? To where do I rotate the tomatoes this year? And eggplants -- do I do Ichiban again, or is there something new and wonderful lurking out there? Thank you for this lovely blog -- I do enjoy it! Won't be any peas sown here in March, Carol, not even SNOW peas. By April, maybe. Or not. Down in the valley, yes, some will be able to sow earlier, those with lighter soils and less weather off the water. But it all balances out, doesn't it? Thanks for sharing your experience and technique for seed catalogs. This will be the first year I use a catalog to purchase seeds. I'm very excited and nervous. You see, winter is good for something. Organizing. Anyway the 12 month growing season is my excuse for not keeping records. I only received one catalogue this year and I think that was because twice I went on line, picked my seeds but never sent! Instead I bough bulbs at the Bulb Society sale yesterday. I spent far too much. Thanks for sharing your fantasy with us, Carol. Two months really doesn't seem that far away, especially when I haven't given any serious thought to ordering seeds yet. Carol, first of all, thanks for hosting GBBD again. As usual, you did a fanstastic job! Next, I so hope you are right about the 2 months. I can hold on that long, but please don't let us have a late spring.I am so tired of winter this year. Probably because I've had to be out in it more. Your ordering seeds ritual sounds like a good way to go. Let yourself order what ever strikes your fancy and then start paring down. That way you had everything for a little while. With a little luck I'll be planting seeds INDOORs in late March. Our springs lately have been very slow in arriving. My task right now is calculating which veggies will give me the longest season of eating from the garden - and how my neighbor and I will divvy up a joint order so that we'll waste fewer seeds. I'm hoping you'll have seeds in one hand and a hoe in the other soon.